Home security cameras give those who use them greater peace of mind. Without security cameras, it's much harder to monitor spaces and feel secure. Since security cameras are now more affordable than ever before, they are great choices for homes and businesses, as well as industrial spaces. 1.) You'll Be Able to Vet Visitors - If you have a home security camera installed that records video footage outside of your front door, you'll know who has come onto your property before they even knock or press your doorbell. As well, if you have loved ones who are vulnerable to due to old age and/or disability, putting a security camera into place near their front doors will help you to give them more information about visitors. When you can see who is there, you'll know whether you want to open your front door or not. 2.) You May Track Business - Whether you work out of a home office, have brick-and-mortar retail outlets, or other types of businesses, you may want to gather valuable information about customers via security cameras. For example, if you are running a car dealership, putting security cameras in place on the premises and investing in some analytic software (security companies like ours will be able to provide cameras and software) will allow you to figure out how many people visit your place of business, what they look at and which demographics they fit into. This is valuable information that will help you to make smarter business decisions. 3.) You'll Be Able to Identify Intruders If you're worried about crime or stalking, having a security camera installed on your property may be the key to identifying those who are shady characters. Video evidence goes a long way in court and it also helps police to track down criminals. Without it, it's much harder to prove anything. Whether you choose an NVR or DVR for recording, we've got you covered. 4.) You'll Feel More Control When you're able to monitor places and events, you'll be in control. Without video feeds of key areas, you may miss important facts about what's going on around you. This is why installing security cameras sooner, rather than later, will be such a great idea. 5.) You'll Protect Things and People You have things and people that you love. You want to protect them. When you have video feeds of areas, you'll be able to see if your things and loved ones are safe. 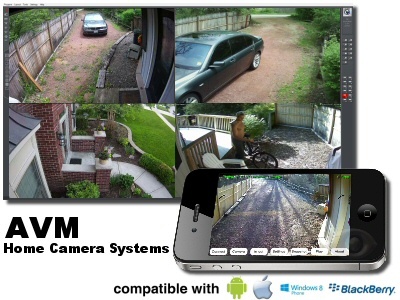 It's even possible to monitor home security video feeds remotely, via mobile devices. This means that you can check in anytime in order to help your things and loved ones remain safe. As you can see, there are tons of reasons to choose security cameras. This just scratches the surface, but for more info, please reach out to our amazing support staff to talk about investing in a security system for your home or business.